A “meticulously researched” (The New York Times Book Review) examination of energy transitions over time and an exploration of the current challenges presented by global warming, a surging world population, and renewable energy—from Pulitzer Prize- and National Book Award-winning author Richard Rhodes. People have lived and died, businesses have prospered and failed, and nations have risen to world power and declined, all over energy challenges. Through an unforgettable cast of characters, Pulitzer Prize-winning author Richard Rhodes explains how wood gave way to coal and coal made room for oil, as we now turn to natural gas, nuclear power, and renewable energy. “Entertaining and informative…a powerful look at the importance of science” (NPR.org), Rhodes looks back on five centuries of progress, through such influential figures as Queen Elizabeth I, King James I, Benjamin Franklin, Herman Melville, John D. Rockefeller, and Henry Ford. 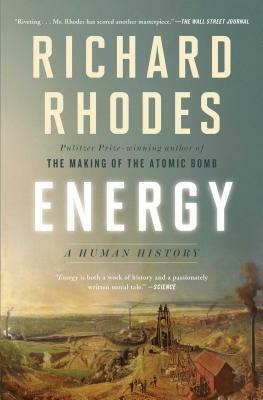 In his “magisterial history…a tour de force of popular science” (Kirkus Reviews, starred review), Rhodes shows how breakthroughs in energy production occurred; from animal and waterpower to the steam engine, from internal-combustion to the electric motor. He looks at the current energy landscape, with a focus on how wind energy is competing for dominance with cast supplies of coal and natural gas. He also addresses the specter of global warming, and a population hurtling towards ten billion by 2100. Human beings have confronted the problem of how to draw energy from raw material since the beginning of time. Each invention, each discovery, each adaptation brought further challenges, and through such transformations, we arrived at where we are today. “A beautifully written, often inspiring saga of ingenuity and progress…Energy brings facts, context, and clarity to a key, often contentious subject” (Booklist, starred review).